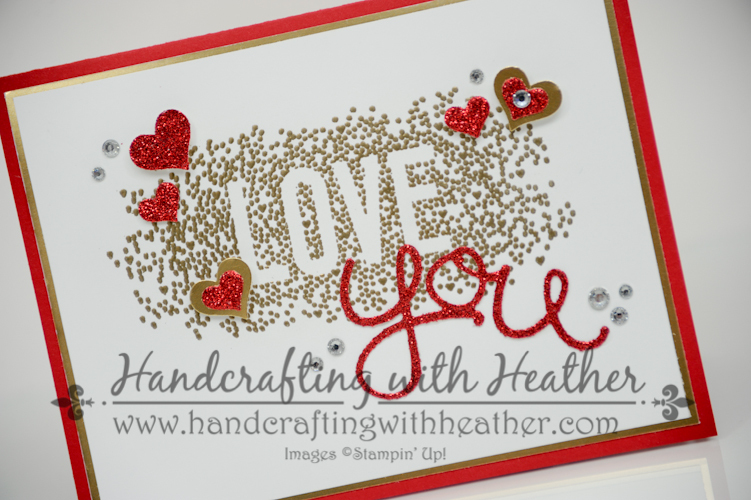 Seasonally Scattered Valentine’s Card – Stampin’ Up! I rarely use retired products in my cards, but I couldn’t resist using the recently retired Seasonally Scattered “love” sentiment for at least one Valentine’s card this season. I think it pairs just perfectly with the Hello You Thinlits Dies, don’t you? It is rare that a card design arrives in my brain fully formed, but this was one of those instances. I could instantly picture how great the Seasonally Scattered image would look in gold embossing powder (which doesn’t photograph well, here… bummer!). 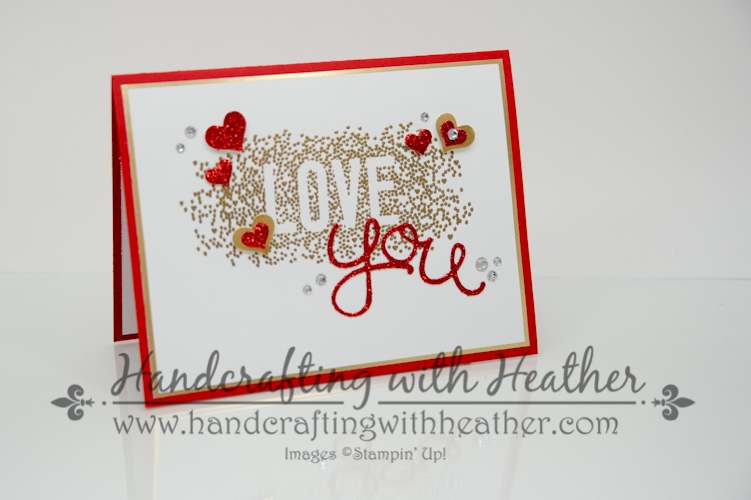 The Red Glimmer Paper was the perfect partner for the Hello You Thinlits Dies too! Throw on a few hearts, and some rhinestones, and voila! 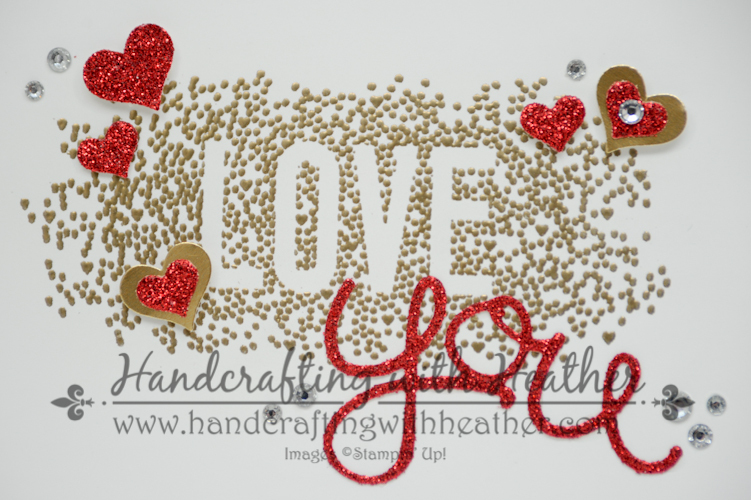 Some of you may have noticed that I used two different sizes of small hearts…. you might be wondering where I got that cute little tiny heart shape. For those of you who were paying attention, it is from the Mini Treat Bag Thinlits Dies. That set has so many cute little extras! I haven’t actually used it to make a treat bag just yet, but those little hearts have come in handy on several projects! Of course you know that I don’t like to leave the inside of a card naked, so I used a few hearts on the inside to finish things off. 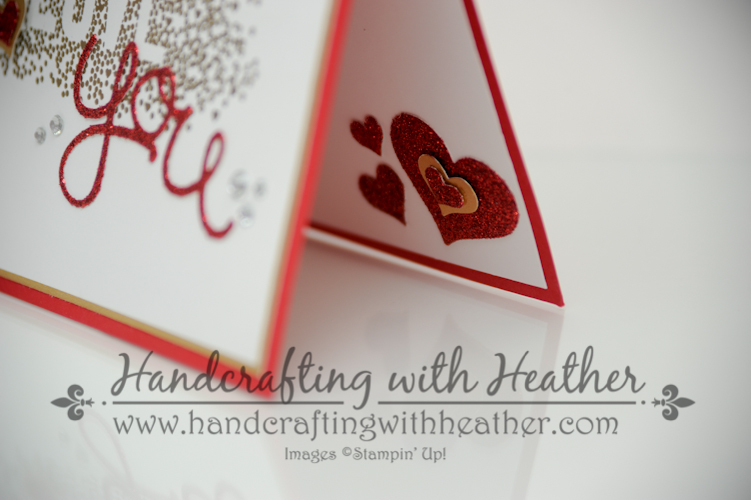 I love how this card turned out, and it was so quick & easy to make! If you are a fan of this project, I hope you will pin it to Pinterest for me. You will find a “pin it” button at the very bottom of this post following the supply list. Good choice of stamp set, lovely card Heather. great combo turned into an awesome card Heather, nice job.